News just in from Thierry Voisin that his central agency for sale, the 29.5m motor yacht Makarena, has had a major price reduction. Makarena was delivered by Turkey’s Bilgin yard in 2006 and accommodates 10 guests in a master, two double and two twin cabins. This superyacht boasts a spacious flybridge with a Jacuzzi, dedicated sunbathing areas and alfresco dining. 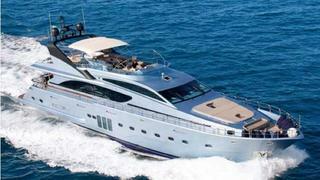 Her cruising speed is 15 knots, with a maximum speed of 24 knots. Her price has come down from €1.45 million to €1.1 million.